We recently published a blog post about our parental control app that highlighted the real life dangers our children face as part of the digital age – and the response has been overwhelming. 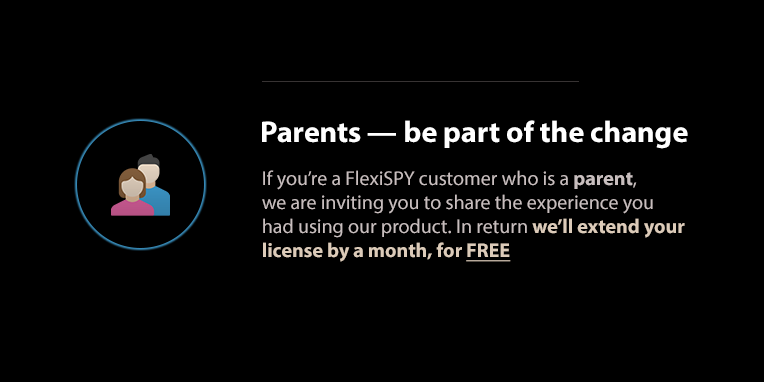 It is both humbling and eye-opening to hear these real experiences from parents and families – users of FlexiSPY – who have found comfort and security in what we offer. These are not tales of spying or losing the trust of loved ones (as some media would like to accuse), but rather stories of suicide prevention, drug intervention, and even tracking down children who have been kidnapped. This got us thinking about our community and working together to make a change – to limit the occurrence of unthinkable events and to protect our children. As parents, our united voice can make a difference. By speaking together on behalf of our sons and daughters we can bring to light important issues that plague our society – and how we can prevent them. Share with us your story, experience, or anecdote and we will extend your license by a month for free – a small token of appreciation for your time. There are times we feel that we are the only ones going through a difficult time with our kids. My son was kicked off the basketball team for using drugs. My straight-A daughter is pregnant. My teenager has been missing for two days. On the other hand, there are times when our children feel they are the only ones going through a difficult time. They are afraid or embarrassed to ask for help or to share their story. Be the voice your kids need, so that other parents find the courage to do the same. Don’t worry if you are not a natural writer, it’s what you have to say that’s important, not how you say it. Here is a suggestion as to what you might write about. How your life has changed with this new knowledge. Any wisdom that you want to pass on to others. Our team will review the information and verify your user account details. Thank you for your continued support parents! Don’t forget to subscribe to our blog to stay up to date on the latest insight and information from FlexiSPY.